Whether you are talking about the big, bad wolf or Little Bo Peep, adjectives are everywhere! They are a basic building block of the English language, and one that’s worth practicing with ESL students. Generally, it’s your beginning students who will need the most practice with adjectives, but that’s not a hard and fast rule. Even advanced students can use practice when it comes to being descriptive in English. Whether you teach beginners or advanced students, when you want to give your class a little fun while practicing those oh so important descriptive words called adjectives, try some of these fun activities. Twenty-One Questions is one of my go to games in my ESL classes. It takes no preparation, and students enjoy it. Plus you don’t have to take a lot of time to play. One round can take five minutes or several rounds can fill an entire class period. The standard rules make it great for ESL students, but don’t stop there. You can play this game with a twist that will emphasize the use of adjectives, especially for the person who picks the object. Normally when you play, one person picks an object, and the rest of the class asks yes/no questions, up to twenty-one of them, to try and narrow down what the object is. By question number twenty-one, the class has to guess what the object is or the individual who chose it wins the round. To stress the use of adjectives, change how the individual answers the questions. Instead of a simple yes or no, she has to use an adjective in her answer. She might say the object is bigger than that or it’s black or whatever comes to mind. The guessers will have a great advantage with this information, so cut the number of questions, too. I recommend giving them eleven questions to guess the object, but you can do whatever works best for your class. The important piece is that the individual answering the questions gets plenty of practice using adjectives during the round. What’s in the room: students play this game with a partner. One person secretly chooses one item in the room, and the other person must guess what that item is. The first player gives an adjective that describes the object. Then the second player gets to guess what it is. If the second player is wrong, the first player gives another adjective and the second player guesses again. Play continues this way until the second player guesses the correct object. The goal for the first player, however, is to stump their opponent for as long as possible. When the second player finally guesses the correct object, the first player scores one point for every adjective she had to give before the second player got the answer right. So if she gave five adjectives before the other player guessed the object, she scores five points. Then players switch roles. The person with the most points at the end of the game wins. This is a great way for students to practice less common adjectives. You might even want to use this game as a tie in to teaching students how to use a thesaurus. If you make flash cards with vocabulary words, this is a great way to challenge your students to review their vocabulary while thinking creatively. You can also use a picture dictionary, photos from magazines, or any other source of nouns. If your items are on cards, gather several cards with nouns on them and shuffle them into one stack. Then have a student choose two cards. That person must then make a comparative statement that ties the two nouns together. For example, if the student drew elephant and spaceship, she might say an elephant is slower than a spaceship. If you are working with a dictionary or magazine pictures and you don’t want to cut up your pages, have students close their eyes and put one finger from each hand on the picture. Whatever their fingers are touching are the two objects they must compare. This is a fun game for the entire class to play. Start with a very simple sentence that has at least two nouns. For example, the man found a goat. Then challenge students to add one word to the sentence at a time making the sentence longer and longer. If it is your turn and you cannot think of another word to add to the sentence, you are eliminated for this round. This is a great activity to talk about order of adjectives in English, especially since many ESL students may think all adjectives are equal in English. If you are unsure about English adjective order, it is generally quantity/number, quality/opinion, size, age, shape, color, proper adj., purpose/qualifier noun. The more adjectives you add to a sentence, the more careful you and your students will have to be about where to place it. 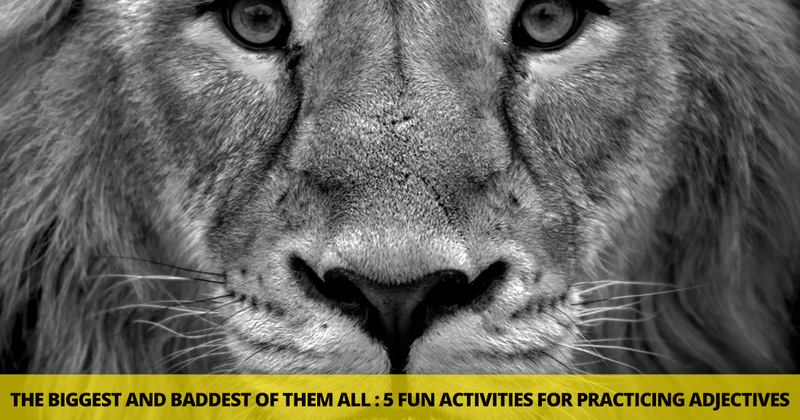 Your students will have fun competing with their peers and practicing their antonyms in the process. Divide your class into two teams, and have each team line up facing the front of the classroom. You give an adjective to the first person in one of the lines, and that person has three seconds to give you the opposite adjective. If you say old, they say young. Happy/sad, big/little, dark/light, fat/skinny, etc. If they give you the correct opposite, they get to return to their seat. If they do not give the correct opposite, they go to the back of their team’s line. Then go to the other team and repeat the process. The first team to have all of their students sitting back in their seats wins the game. Practicing adjectives can be a lot of fun, especially when you do it with these fun activities. But don’t let the laughter stop here. There are plenty of other ways to practice your favorite descriptive words. So let these ideas inspire you to others that will keep the ball rolling down a steep incline.